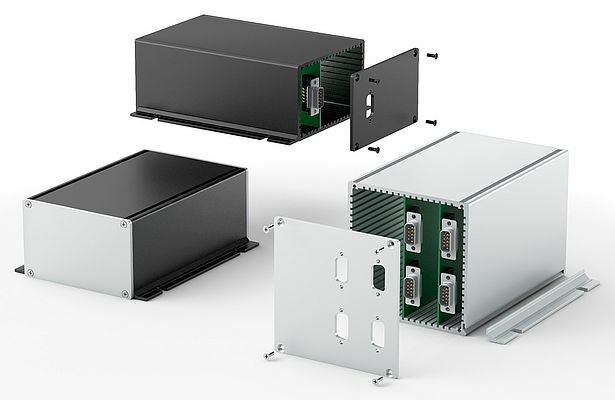 Often devices from one electronics series are used as free-standing or as a housing for wall and ceiling assembly based on the applications. Often the circuit boards used must be installed into these housings both horizontally and vertically with the corresponding electronics components. For these applications, Fischer Elektronik is offering two new models of the TUG housing series effective immediately. The practical, functional and solid tubular housing TUG V with rotating guide grooves in a grid 5.08 mm and the lateral flaps which can be installed without screws allow lowering and horizontal reception of the circuit boards. The basic housings are available by default in five lengths (100, 120, 160, 200, 220 mm), and in three different surface models. An EMC-appropriate design, made possible through the use of electrically conductive transparently passivated surfaces and additional conductive seals, is also offered. Protective class IP54 can also be achieved through the use of special seals. All housings can be mechanically processed, surface-treated and printed by customer request in addition to the standard models. The tubular housings are supplied as a disassembled kit including cover plates and installation materials.